Fidget - "PAMS And Other Conspiracies"
Each year, thousands gather in the Black Rock Desert in Nevada, US for The Burning Man Festival, an “annual experiment in temporary community dedicated to radical self-expression and radical self-reliance”. Why do I mention this? Because PAMS and Other Conspiracies is a series of sound collages built entirely from field samples recorded at Burning Man. These recordings were layered and put together using electronic processing and non-linear editing techniques. On first listen, I had not read anything about this recording, and I admit I was a bit baffled by the strange three-dimensional landscapes of noise I heard. I’m sure many listeners would not even consider this music, but to those who embrace John Cage’s definition, “anything that is intended to be music is music” may find this quite an interesting odyssey. After I had read about the source of the recordings used, I was able to listen to the compositions in a new light. Fidget is Erin Anderson, one half of the electronic experimental duo Flowchart. 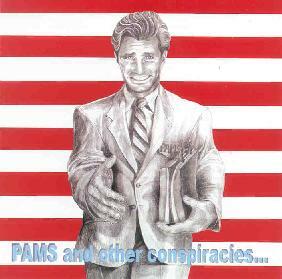 On PAMS and Other Conspiracies, she takes the concept of “radical self-expression” to heart. This seems as much about Anderson’s experiences at Burning Man as anything. And from the opening siren-like screech of Just Look at the Sun, it’s clear her experience was an active and exciting one. Samples of voices talking, background noises, people making music, etc., are manipulated electronically, and inter-cut in a sonic pastiche. Sometimes Anderson works the samples into a rhythm of sorts, like the bizarre noise structures of Whatz Your Name?, which incorporates chanting and numerous other sounds that drift in and out of the rhythm. Other times, she lets the samples speak for themselves, like on Subvert the Subversion, where a neo-hippie gabs on about the problems with government foreign policy. It’s all fascinating, to be sure, but not very easy to listen to. Anderson is doing her own thing here, oblivious to the audience, and they can choose to listen, or walk away. But isn’t that what radical self-expression is all about?